This desktop gadget is a multi-purpose system monitor with focus on visuals and FUN! 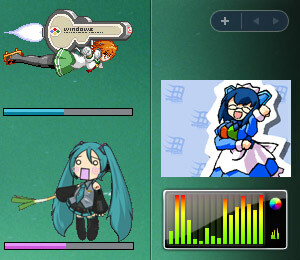 How about a cute Anime gal who dances according to the CPU usage? An animated flag which waves faster when your drive is busy? The famous Matrix digital rain effect with scroll speed corresponding to your network traffic? It's up to your imagination! The latest version of System Animator supports the monitoring of sound output! What does it mean? Well, imagine your favorite Anime character singing and dancing to the beats LIVE when you play whatever song on your computer~! The visual effects are especially interesting with certain songs (especially those with strong and clear beats). Pretty cool, right? 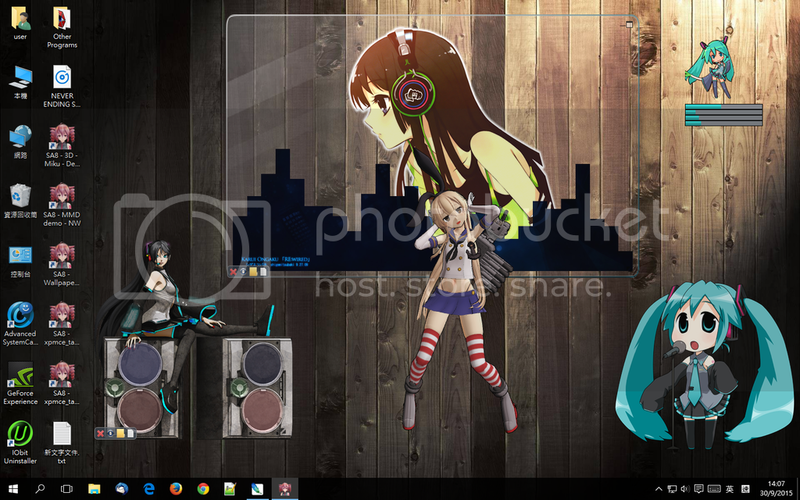 I don't think this is something you can do with Rainmeter or most other desktop buddy programs! Click the above picture and watch System Animator in ACTION! This video demonstrates System Animator as a multi-purpose PC activity monitor, as well as a music visualizer, with interesting and fully CUSTOMIZABLE animation! Download "System Animator" from the link on my signature! Questions? Comments? Bug reports? Let me know! I know that there are some people who don't understand exactly what this gadget does just from text description and static screenshots, and others who simply ignore all gadgets in general thinking they are just some useless junks. Well, maybe this video will change your mind. EDITED: Check the YouTube video links up there in the first post. I assume once again this works only for Vista, or Xp with the Vista sidebar download? i thought you could download the toolbar....i heard it was google toolbar. My computer is only used by me, and I have no idea whether it shows up on other accounts. It's nice to have 2k-san dancing to my CPU usage. Quote from: "CaptBrenden" I assume once again this works only for Vista, or Xp with the Vista sidebar download? For XP Sidebar, I recommend this one. I have already received reports from XP users on other forums saying that System Animator does work on this Alky Sidebar, at least up to the point of "Sound output" monitor support. I would really appreciate if more XP users can try it and report anything unusual to me so that I can fix it. I don't think Rainbar is really a Sidebar. It's more like a Sidebar-like application with fixed functionality (from rainmeter?). If you are using XP and want to try it out, you'd better try the "Alky Sidebar for XP" program I mentioned up there. PERSON! ANSWER QUESTION PLZ! KTHXBYE! You can have one or more than one System Animator running anywhere on your desktop. Yeah, if you can get your itunes to play on your computer. System Animator can respond to any sound on your computer, from media player to even external microphone. I think Chocofreak13 is asking whether the Sidebar shows up on multiple accounts if it is installed. yeah, that's what i was asking! eh, i'll download it, if he deletes it i'll just download again, that's what i did for my schoolwork and snood. but not right now, my computer is a tad slow, and i'm downloading a huge chunk of nijikaku.